Although this time of year is mainly filled with joy, there are many aspects of the Christmas season that bring upon massive bouts of stress – such as holiday traffic, crowded shopping malls, the inability to find the right gifts, and the overload of paper work piling on desks at work. Now my job doesn’t really involve a lot of that, but my boyfriend Corey works at a company that is busiest at Christmas-time. So after texting me this morning to tell me that he was getting stressed, I knew that a little stress-counteracting was in order. 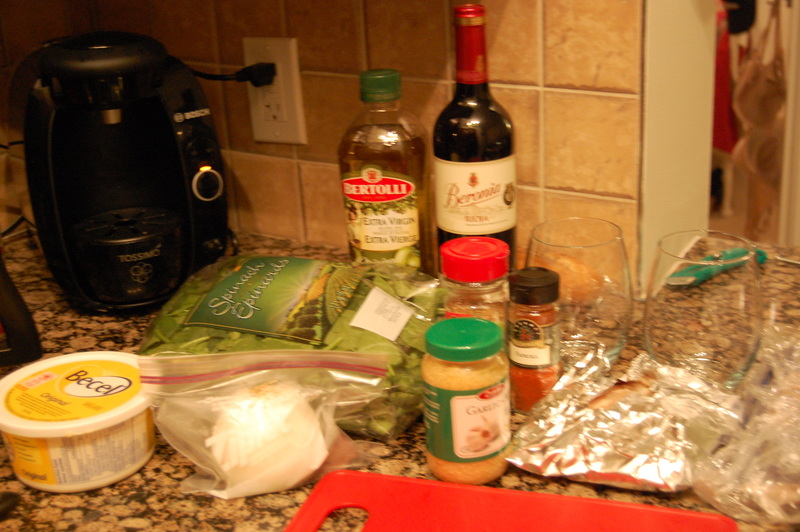 We really like to cook and make lovely meals accompanied by large glasses of wine. So that is exactly what I did. I made a meal that I’ve made before, a recipe by Jamie Oliver that is absolutely delicious and is so simple! 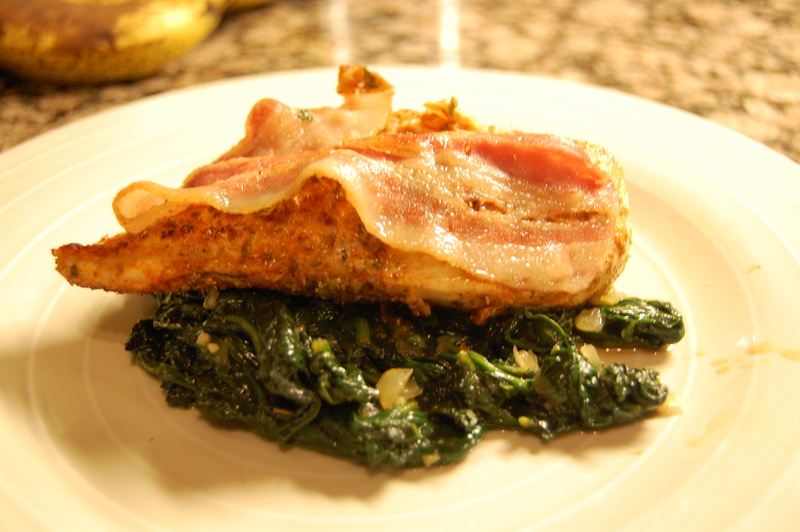 Tray baked chicken with sautéed spinach. I made a few variations, and I seem to have lost the original recipe – but I’ll share with you what I did. I started by preheating my oven to 400F and getting together all the ingredients that I needed. Next, I grabbed a plate and created a mixture of paprika, dried oregano, and olive oil and then proceeded to coat two boneless/skinless chicken breasts in the mixture. 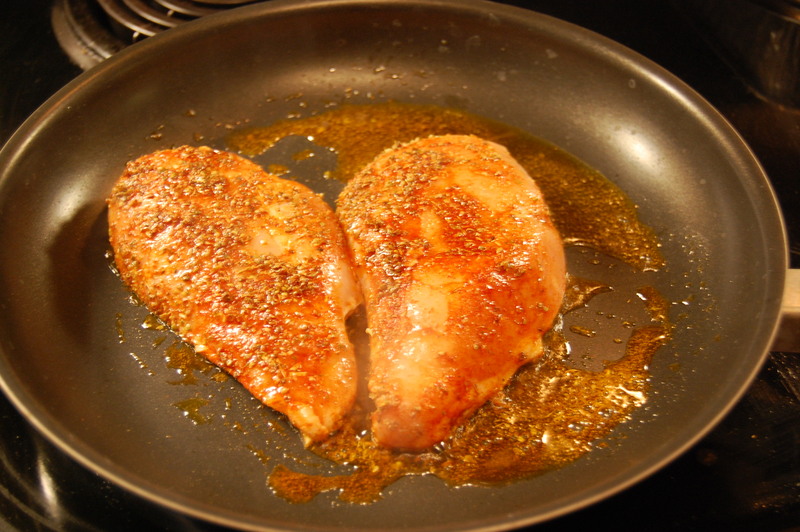 I threw the two breasts (chicken breasts that is) in a frying pan with a little olive oil and browned it on both sides (about 5 minutes). I didn’t cook it all the way through yet. 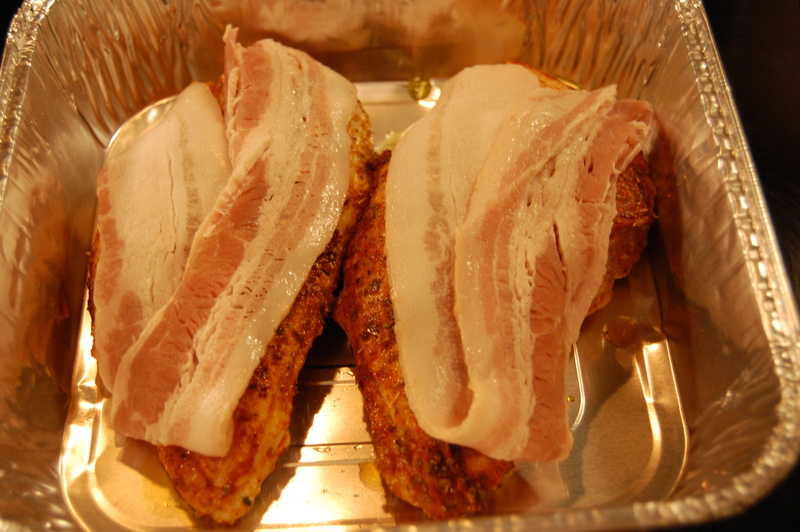 I then transferred the two pieces of chicken to a square roasting pan (I have yet to purchase one so I used a throw-away aluminium one), and I covered each breast (again…thats the chicken breast) with a slice of raw bacon. I’m pretty sure the original recipe then called for some cherry tomatoes and lemon to be thrown into the pan to bake with the chicken…but I skipped that step. A nice touch of rosemary would be good too. I baked that until it was cooked, about 15 minutes. Then, in the frying pan I sautéed some white onions and garlic in some olive oil and butter. 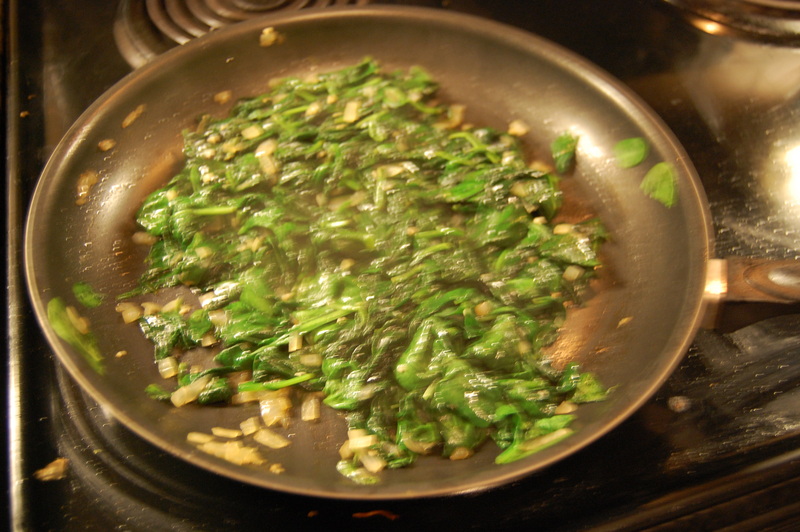 I then added an entire bag of spinach and covered the pan, sautéing until the spinach wilted down. I then tossed it in some salt and some parmesan cheese and served it alongside the chicken. And to top it all off I had my favourite wine. 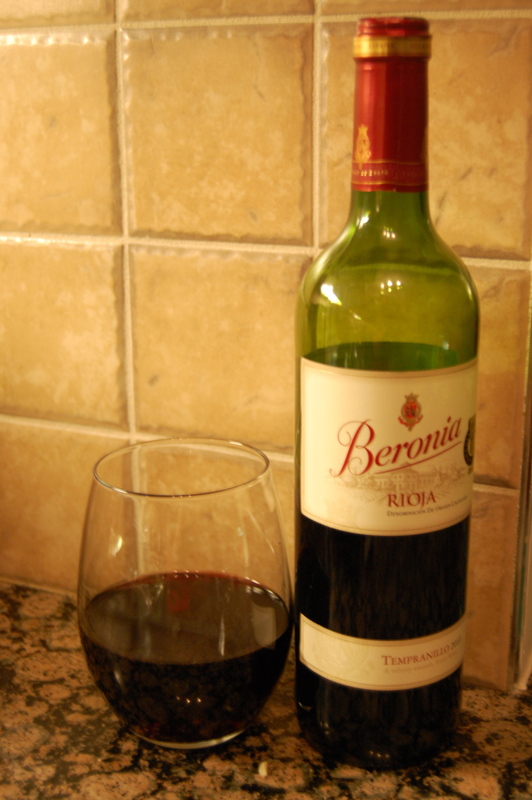 Beronia Rioja Tempranillo (2010) – found in the Spanish section of the LCBO (although often hard to find – not in very many locations). It’s delicious!!! And there you have it! A simple, fast, easy and delicious meal that will impress your family and friends, and will fight the Christmas stress!! Enjoy.